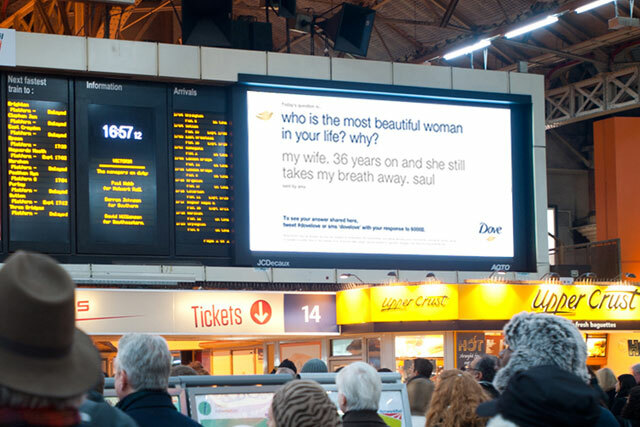 Dove, the Unilever-owned beauty brand, has rolled out a screen in London's Victoria station, which displays tweeters' responses to questions about women and beauty. From today (13 February), Dove will post a daily question, including, "What makes you feel beautiful? ", on JCDecaux's large-format Transvision screen in the station, which has an estimated footfall of 350,000 people every day. Responses sent via Twitter or SMS will be posted on the screen. There will also be a team of Dove brand ambassadors at the station, sharing gifts related to the question on the screen, with commuters. On Valentine's Day tomorrow, commuters will be asked, "What do you love about your Valentine? ", while the Dove team will be handing out white tulips to commuters to share with their loved ones. The campaign was created by Billington Cartmell and was booked by Kinetic and Mindshare. It runs until 19 February and is part of the brand's ongoing 'Campaign For Real Beauty', which launched eight years ago. In January, Dove made a foray into YouGov BrandIndex's top 20 brands, replacing Nokia. Unilever is currently reviewing its estimated £3bn media planning and buying business, currently handled by Mindshare in the UK.